Temperatures will reach 50 degrees today, but more cold air is on the way as a storm system moves through. 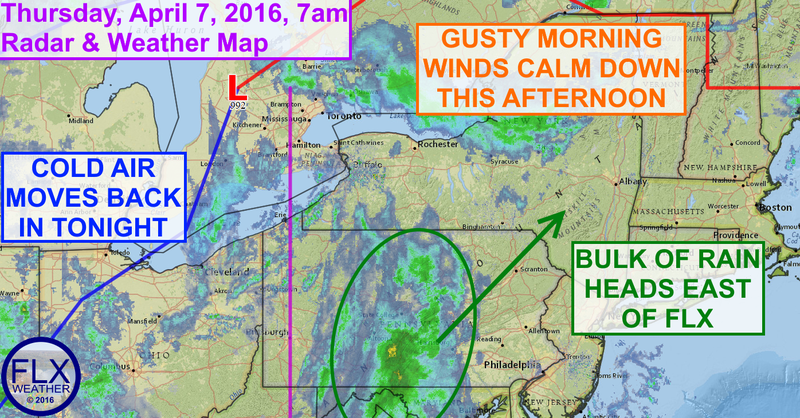 Low pressure over southern Ontario is helping move warm air north into the Finger Lakes region. Temperatures Thursday morning were in the 40s, and highs should top out near 50 today. That is almost normal for this time of the year. The bulk of the rain associated with this storm system will pass east of the Finger Lakes, tracking from central Pennsylvania into eastern New York and New England. Still, numerous showers will be possible on and off throughout Thursday and into the evening hours. Winds will continue to be a bit gusty this morning, but should calm down substantially this afternoon. There will likely be a lull in the precipitation tonight before more rain and snow showers move in for Friday. With highs struggling to the mid 30s, some of the normally colder areas in the eastern Finger Lakes could see some minor snow accumulations. Precipitation will end Friday afternoon, but some more snow showers will be possible across the southern portions of the region on Saturday morning. Little to no snow accumulation is expected before the precipitation ends and the sun works its way out late Saturday. Temperatures will only be near 30 degrees Saturday, with wind chills in the 20s. Sunday will start out sunny, but clouds will increase later in the day with highs in the mid to upper 30s. Snow will move in Sunday night, but will quickly change to rain showers. Rain will persist for much of Monday with a few showers lingering into Tuesday with temperatures in the 40s.